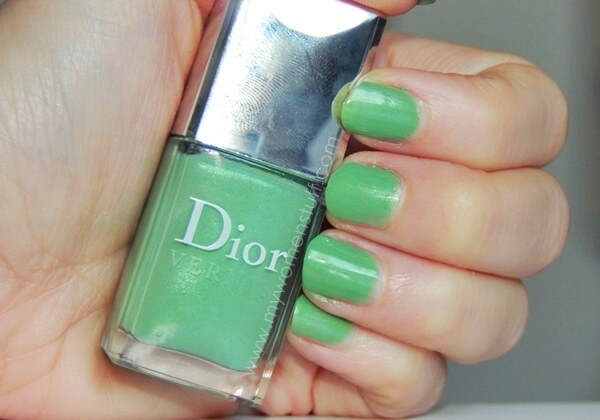 When I first got wind of Dior’s upcoming scented nail polishes for Spring 2012, I pulled a face like you wouldn’t believe. It’s rose scented to boot! Urgh! In my mind I kept thinking of Anna Sui polishes and how the rose scent is so strong you can smell it even when you stick your hands as far from your face as possible … and we know that’s not possible in day to day life. So I was thinking yuk! In a manner of speaking, it does. Despite looking rather flat in the bottle, when you look at it properly you will notice very very fine golden shimmer. It is super fine but its what gives the colour lift and dimension. This shot shows the colour truer to life, for the polish in the bottle. Squint. See the golden shimmer in the bottle? That’s what makes this polish look a little more special and it adds warmth into an otherwise flat pastel mint green I would never ever wear on my nails. In the shade, the colour looks duller and more flat but in the light it takes on a much more interesting colour. Ever since applying it, I’ve been peering at my nails, if only to see the golden shimmer in it because for me, that’s what’s makes this colour special. What about that rose scent I was complaining about eh? Ah happily, the rose scent is only discernible when you hold your nails up to your nose. The polish itself isn’t scented. The rose scent only starts to appear when the polish dries on your nails. I can’t smell it other than when I hold my nails up to my nose and unless you are in the habit of picking your nose, you won’t smell it either 😛 I don’t see the point of the rose scent – if I wanted a rose scented polish, I’d get Anna Sui. Its stronger than any perfume. Half a bottle was spilt on my floor recently and my house smelt of roses for days! A limited edition pastel green with very fine golden shimmer that adds warmth to an otherwise flat colour. Pastel shades are hard to wear so the gold shimmer keeps things interesting and lifts and adds dimension to the polish. In the shade, the colour is rather flat while in the sun or in the light, it reflects better. I find the colour clashes with my skintone but under warm light, it looks better. I got it looking opaque in 2 coats and topped with a top coat. The rose scent as touted is only discernible up close to the nose, and only when the polish dries on your nails, not otherwise. One more note, on my skintone, Waterlily looks much better under warm light than in natural daylight. Under warm light, it takes on a golden sheen which goes better with my skintone, and this colour just looks better on me then. In daylight, I am reminded of this wall paint swatch called Mint Green, like the green of peppermint chocolate chip ice cream – just not quite me 🙂 Oh and if you are really worried about that rose scent, its now Day 3 and the scent is all but gone. Perfect by me! 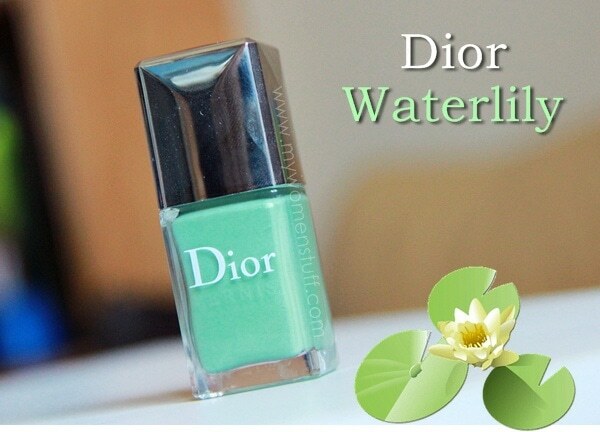 Is the Dior Waterlily a colour you would wear on your nails? How do you feel about scented nail polish? PREVIOUS POST: Your Say: What’s your favourite NON-beauty item of 2011? NEXT POST: The Lipstick Bandits Wish You A Happy Sparkly New Year! Haha there a faint rose scent when you hold it to your nose. Just don’t go walking around with your fingers stuck up your nose 😉 The quints are very sheer. To be honest, I don’t think much of them although they look super pretty! Pretty pretty! I’m glad the rose scent disappears…I don’t really see the point of scented nail polish, to be honest. I do desperately want this color, though! Somehow, I don’t think it will change your mind haha! I personally prefer deeper, more vibrant shades on my fingers, when I do paint my nails. Pastel shades, like anything else make me look washed out. I like it! I don’t have any Dior polishes, but I think this shall be my first! AHHHH gorgeous! I pre-ordered a couple when I found out it’s not as cool-toned pastel as I’d initially thought because of the gold shimmer/yellow undertone. It’s a cute green against your skin. Thanks for sharing! I prefer deeper bolder nail shades too. Im not very good with application thou so I’ve learnt that a light shade is more forgiving 🙂 I wish it looked like it does in that last picture all the time! Not a colour I would wear sadly D: somehow I don’t think it will look nice on my nails >_<"
I don’t really see the point of scented nail polish.. it’s not like I usually smell my hands during the day.. lol. But the color is so gorgeous. I’m a sucker for green polishes hehe.. I didn’t get the idea behind scented nail polishes too. If anything it gives me a headache if the scent is too strong. Ooh…I painted this on Chloe’s toes and the purple one on Ashlyn’s toes and OMG… they looked so cute. The colours, especially this green one, look really good on their little toes. The nail polish doesn’t smell like roses when wet, but once dry, the rose scent is quite subtle and pleasing. Sounds disgusting, but I actually put their little toes to my nose for a whiff. LOL! This scent is much better than the Revlon ones which gave me a headache! I prefer Rmk fall collection green nail polish. The colour complement my skin tone very well. I’m fair with yellow undertone. 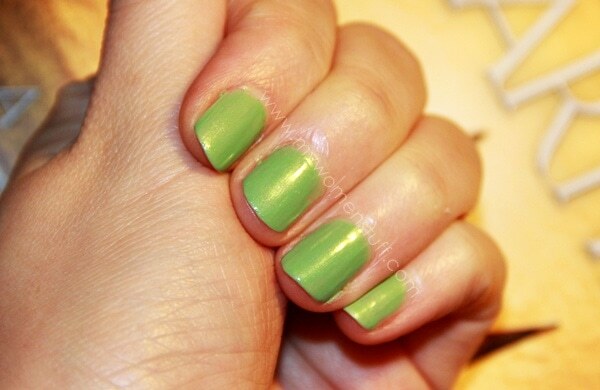 For some reason I actually love green nail polish and this color is simply gorgeous! This is such a beautiful shades. I’ve noticed that such colour will be huge for Spring!